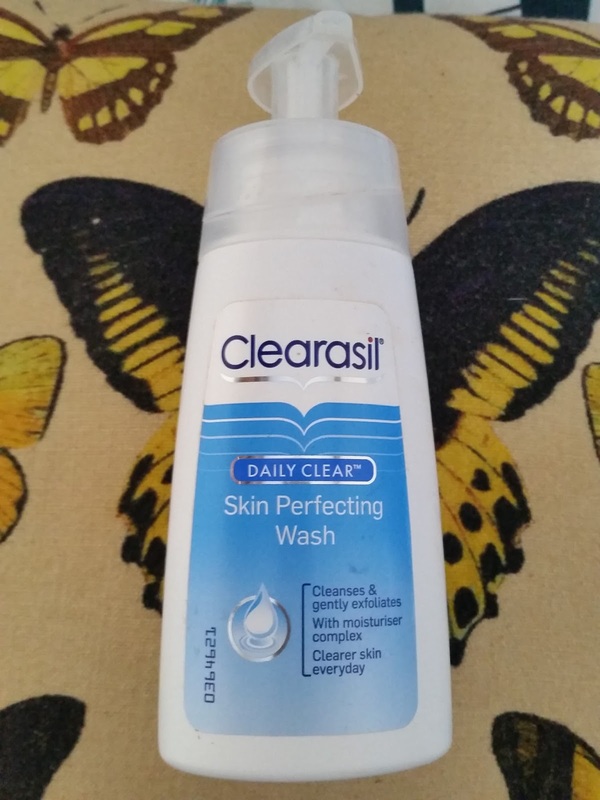 I must admit i have used the Clearasil Daily Clear Skin Perfecting Wash for many years. Ever since i was an hormonal teenager who's skin had a mind of its own and those pesky spots would appear out of no where! I tried every acne face wash there was and my skin was left and felt like, what have u done to me?! 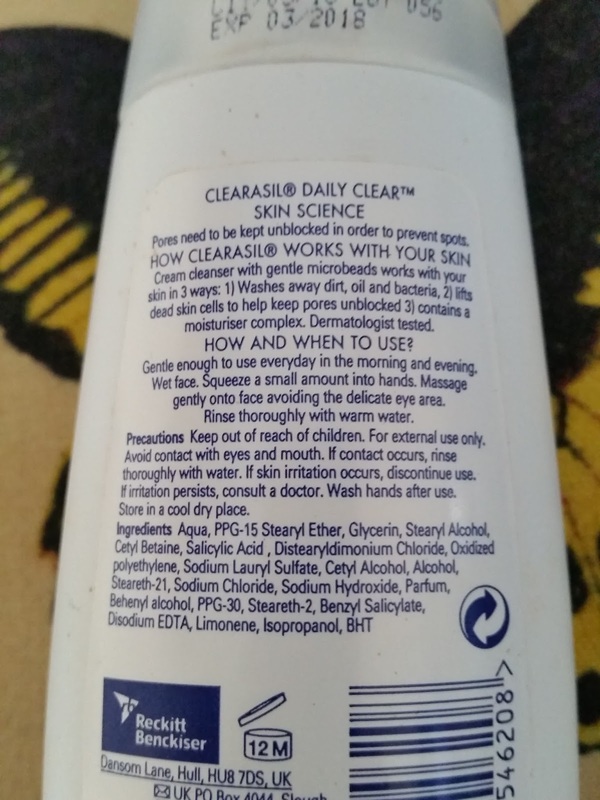 Some face washes stripped my skin so much it was then over producing sebum which left me in a vicious cycle. 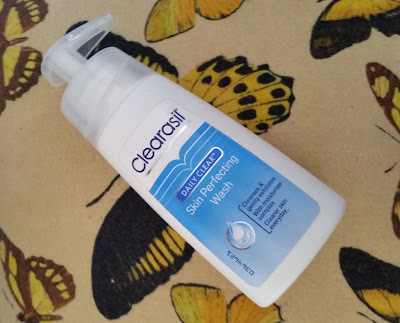 Very oily skin which then lead onto blocked pores and hey presto, spots! I would reach for those spot creams that would contain Benzoyl Peroxide and would feel the burning sensation that would then leave me with redder skin than the actual acne was to begin with. Now those treatments might work for some and that's great, but if your like me and they didn't then its all about finding the right treatment for you and that works best for your skin. Perfecting Wash on a fluke. What did i have to lose to try this and if it doesn't work then ill be on the hunt for another product. Clearasil Daily Clear Skin Perfecting Wash.
1. Cleanses and gently exfoliates. Pores need to be kept unblocked in order to prevent spots. Cream cleanser with gentle micro beads works with your skin in three ways. 1. Washes away dirt. Oil and Bacteria. 3. Contains a moisturiser complex. Wet face and pump a small amount into hands. Clearasil Daily Clear Skin Perfecting wash is 150ml and comes with a handy pump. You can pop the lid off if you don't like using the pump. What i like about the skin perfecting wash is that it is so creamy and gentle. Even the micro beads are gentle and you do not feel like your rubbing gritty sand all around your face. Your face feels really clean and exfoliated and best of all it feels moisturised! Not stripped of all its moisture and oils. I even washed my face three times to test if it would dry and strip the skin and it didn't! This does calm skin down through break outs and i found this prevents from major spots forming. Like i have stated i have been using this for years and really like it. This is in my skin routine and is staying for many years to come! If your looking for a facial wash that is a cream cleanser and is gentle and not harsh! Beat Acne, Love Your Skin.